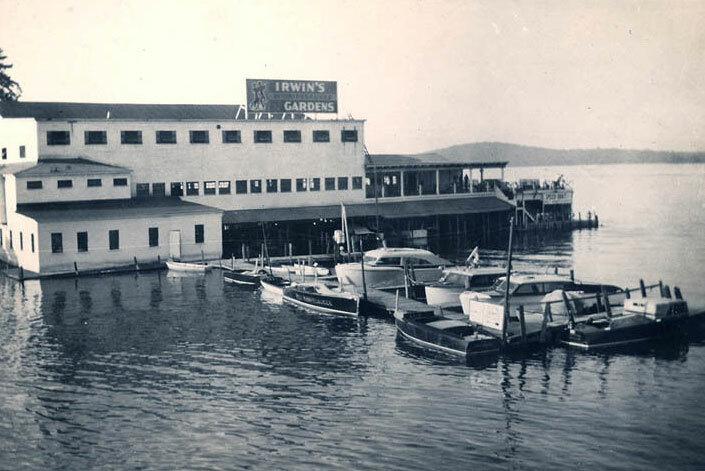 Circa 1950 photo of Irwin’s. This photo has been colorized. The colorized photo is ©2017 and may not be used without permission. The original black and white photo is shown first. 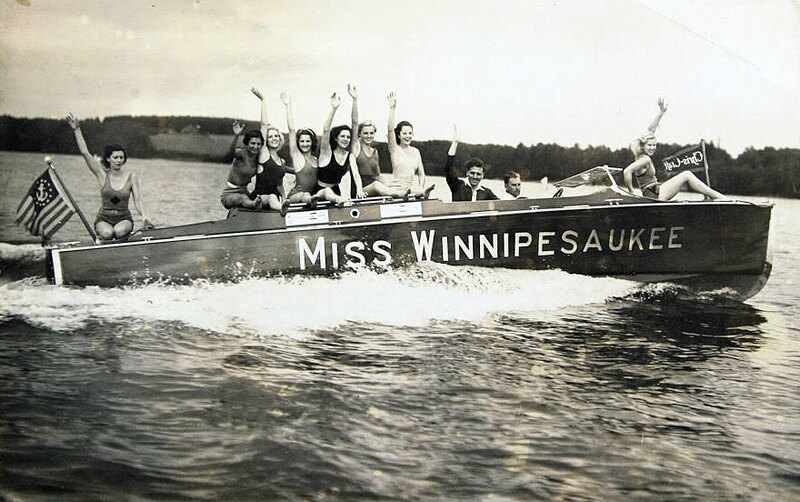 The Miss Winnpesaukee speedboat is ready to take its next group of passengers for a ride. 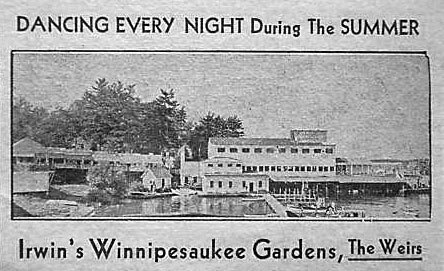 Notice the Hotel Winnecoette high up on the hill in the upper left corner of the photo. 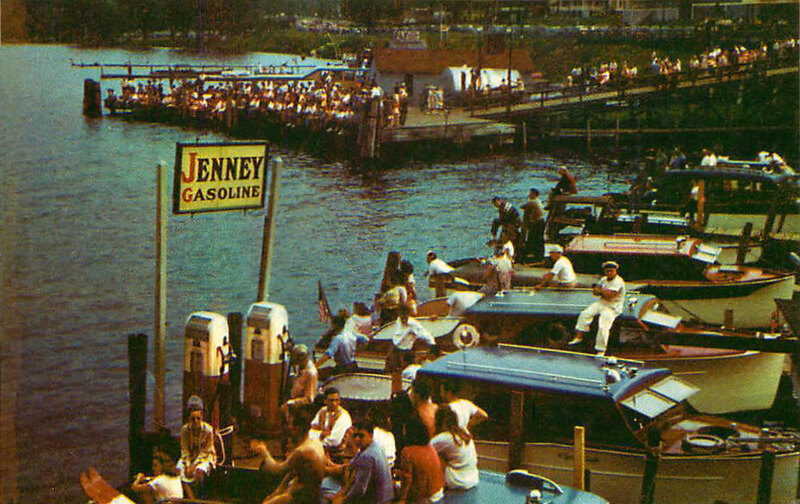 Also notice the gas dock. 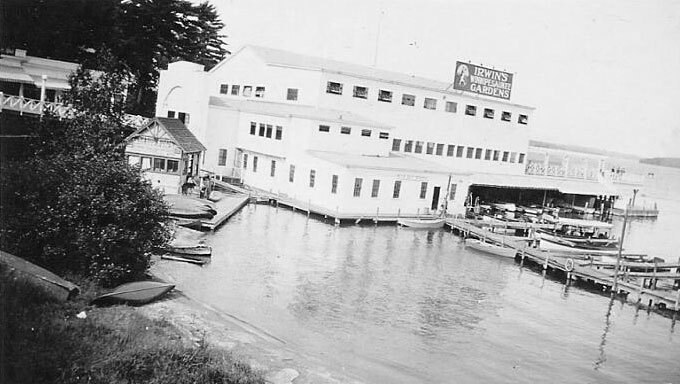 The Jenney Manufacturing Company’s home office was on the old Central Wharf at 75 Central Street in Boston. 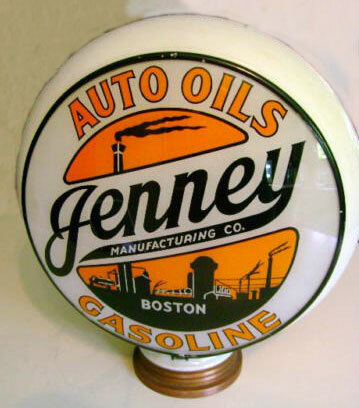 Founded in 1812, it initially sold whale oil, coal, and kerosene. Beginning in 1884, it sold gasoline. 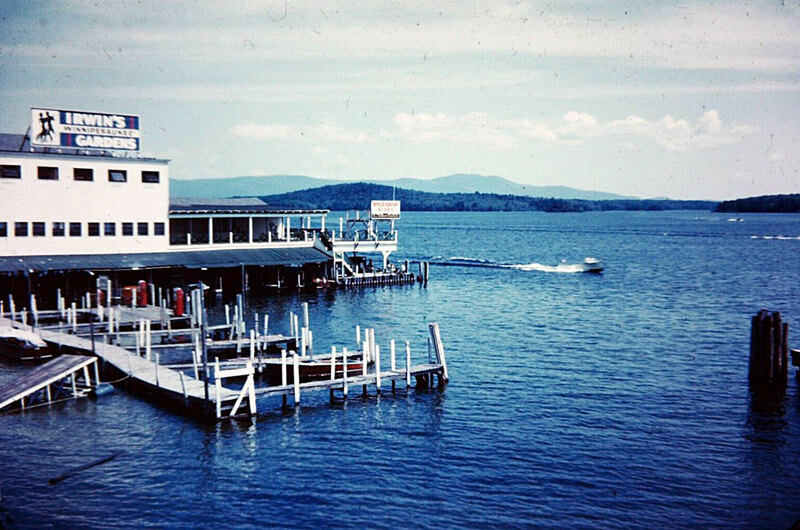 It built up a large network of gas dealers throughout New England and was New England’s “largest independent gasoline marketer with a countrywide reputation for quality” before it was bought out in 1968 by Cities Services, better known as Citgo. 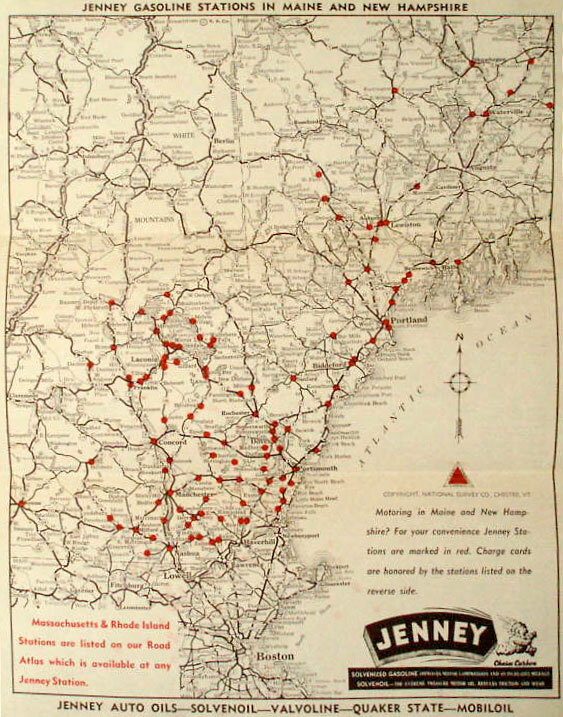 A map of Jenney locations. 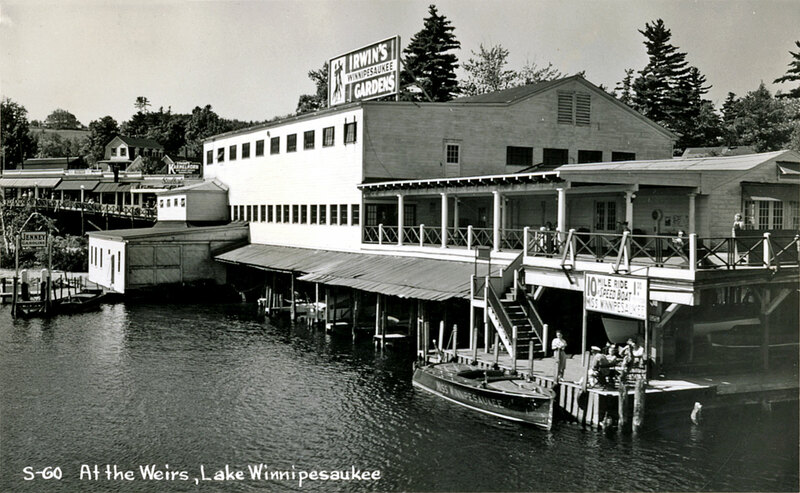 Besides the Weirs, Jenney had three other locations on Lake Winnipesaukee – in Lakeport, Glendale, and Alton Bay. B&W photos above from the 1940’s. Color postcard below from the 1950’s. Color slide from 1957. 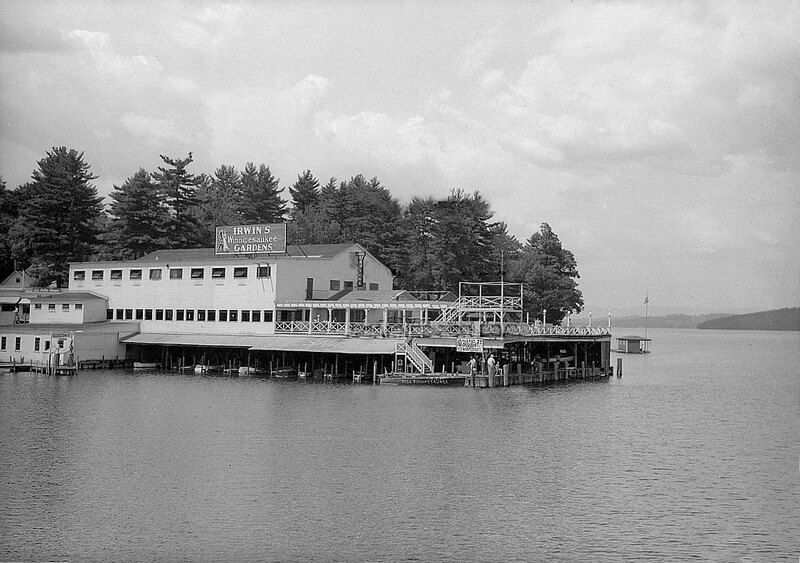 Notice the waterski ramp, lower left. 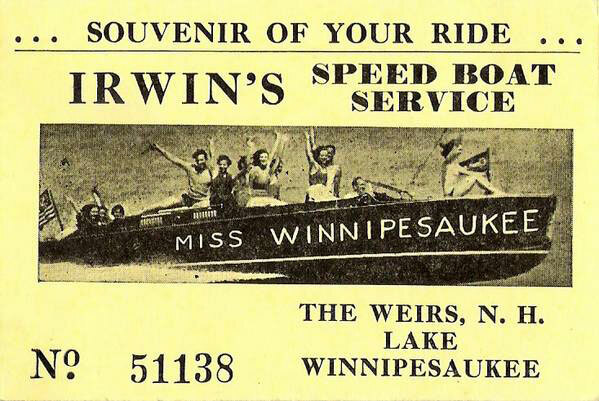 A speedboat ride ticket stub. 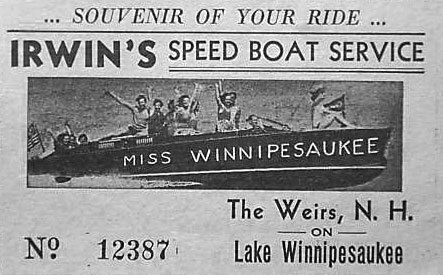 An earlier speedboat ride ticket stub. The reverse of the above ticket. 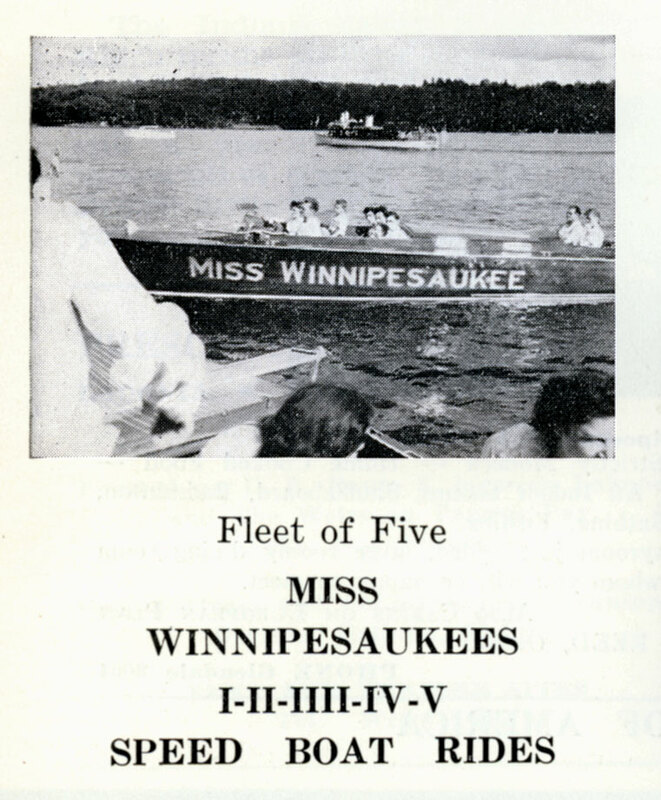 Advertisement from the 1949 Lakes Region Association’s Where To guidebook. Notice the Uncle Sam heading out in the background. 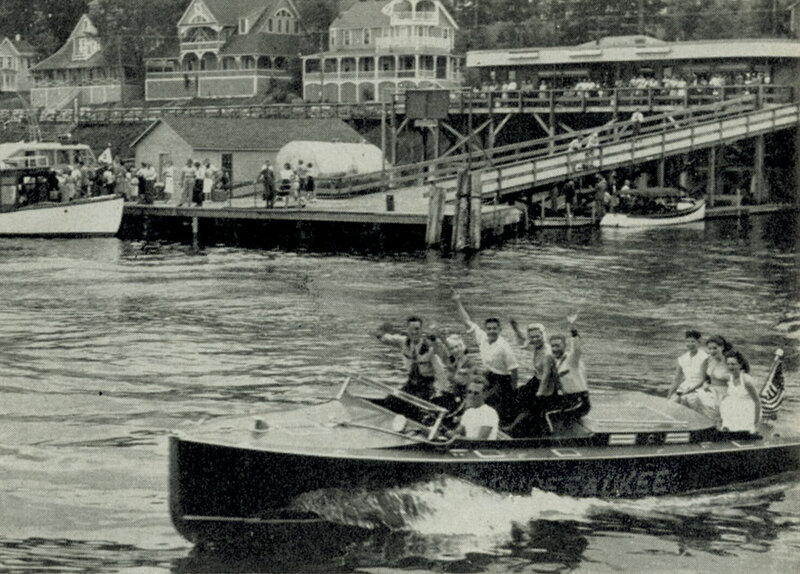 A group of Motorcyclists, in club uniform, ride the speedboat. 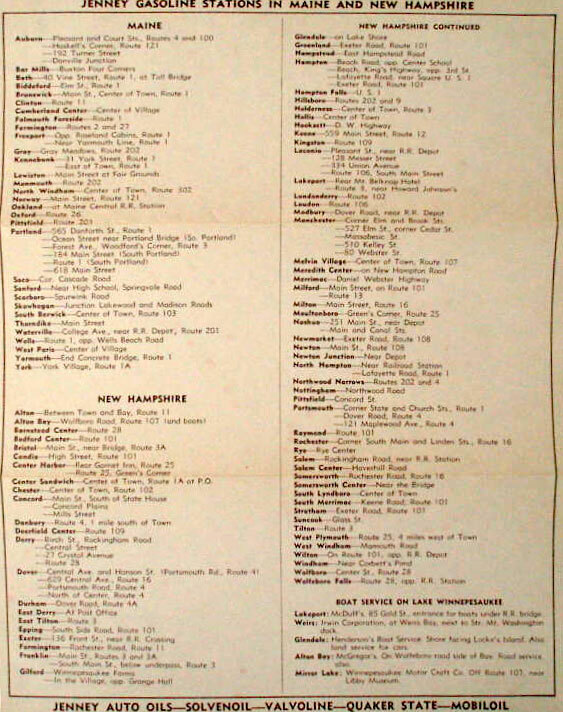 From the May, 1952 issue of American Motorcycling. 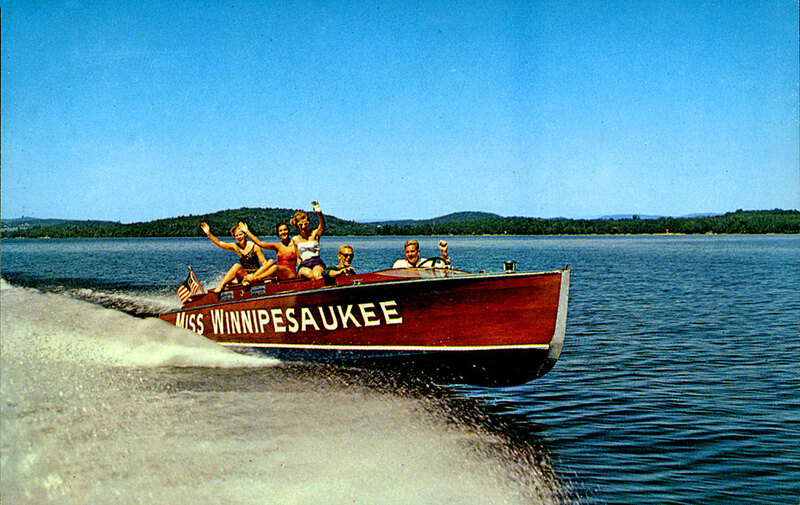 Advertisement photo from the 1959 Lakes Region Association’s Where To guidebook. The ad claimed that over 1 million people had enjoyed the thrilling ride. 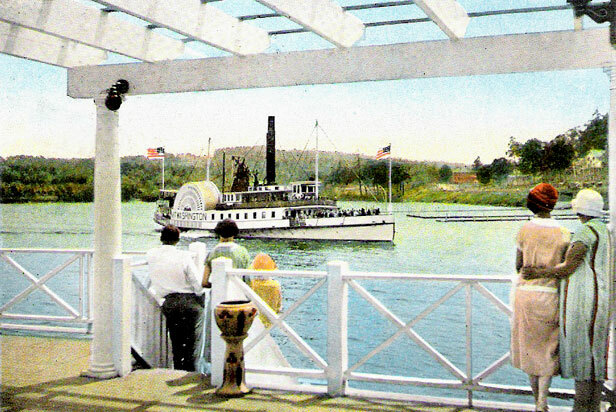 A 1930’s view of the old Mount Washington steamer, from the stairs that descended down to the speedboat ride. For a terrific video about Irwin’s click here. 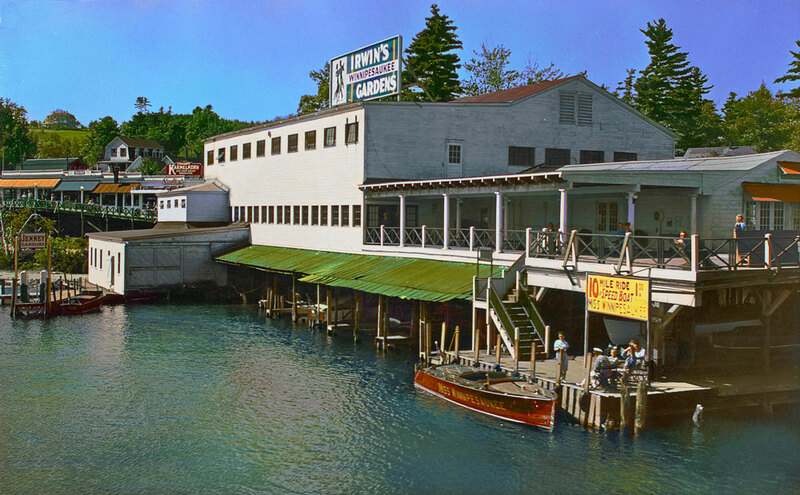 The video is about Irwin Marine, and debuted on NH’s WMUR TV station Chronicle show on May 1st, 2012. 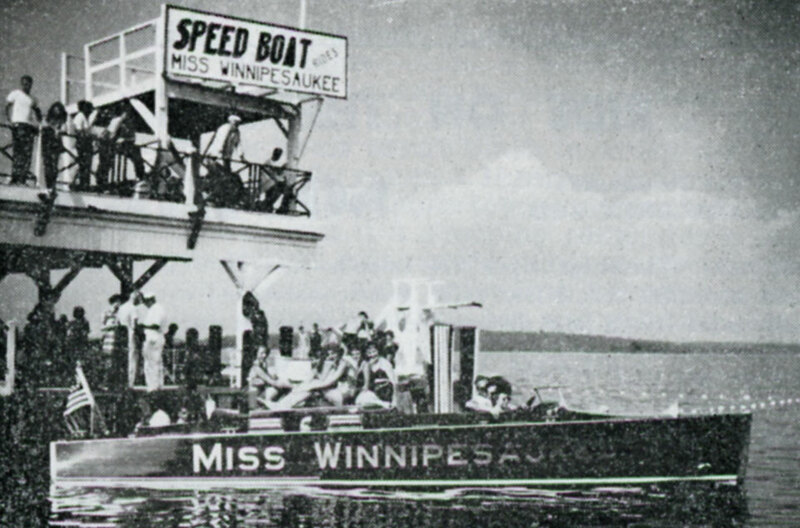 However, the video also includes some rare footage of the old Mount Washington steamer in action, scenes from its 1939 destruction, and the launching of its replacement, the MS Mount Washington.